We offer a full line of top quality meats that are hand-cut and ground fresh in our stores every day. Our Choice Angus beef is the juiciest, most tender beef you’ll taste. Depend on IGA Choice Angus beef for tenderness, flavor and consistent quality. 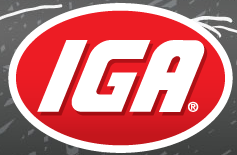 Expect to find the best produce in town at your IGA store. We’re proud to offer locally grown fruits and vegetables at every opportunity, and we triple inspect all our produce for the best quality.Click HERE to learn more about IGA produce department and the local farmers who provide you with your food! Whether you’re planning a special event, or just planning to make any day special, we have everything you need in our IGA delis. Choose from our high-quality deli meats and cheeses and bakery-fresh cakes, cupcakes and bread. Or try our award-winning chicken – either fried or whole rotisserie. Visit your nearest IGA deli for daily meal specials or to place custom orders for cakes, party trays or large chicken orders. Click HERE to learn more about what your deli can do for you!